The world's most polluting nations must seek a consensus on climate change, Australian leader John Howard has urged ahead of talks on the issue. With the US, Russia and China attending the Asia Pacific Economic Co-operation (Apec) meeting this week, progress on the issue was vital, he said. Global trade and regional security issues will also be discussed by Pacific Rim leaders meeting in Sydney. Mr Howard called on protesters to refrain from violence at the summit. With President George W. Bush arriving on Tuesday, and with Chinese President Hu Jintao and Russian President Vladimir Putin also attending, the meeting is likely to be a focal point for thousands of environmental campaigners and opponents of the Iraq war. Security for the event has been extremely tight with the Australian government spending A$169m (£68m, $138m) on security measures. A concrete and steel fence has been built across the city centre to protect the 21 leaders attending the meeting while more than 5,000 police and troops have also been deployed. 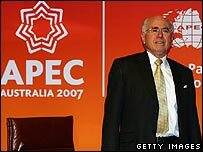 "There will be some individuals who want to protest against Apec," Mr Howard said on a recorded message on the YouTube website. "I simply ask them to stop for a moment and consider that if they are really worried about issues such as poverty, security and climate change, then they should support Apec not attack it." But while Mr Howard has been calling for progress on climate change, the Australian premier has come under attack from developing nations within Apec. They point out that Australia and the US are the only industrialised nations not to sign the 1992 Kyoto Protocol. Mr Howard, who is seeking re-election this year, has called for a "flexible framework" to reduce global warming. However, discussions are likely to fall well short of binding targets for cutting greenhouse gas emissions that environmental groups are seeking. "Nobody is arguing you can fix climate change at the meeting," he acknowledged. "If we can get some consensus on a way forward on climate change out of a body including America, Russia and China, that's a huge step forward." Pressure will also be on Apec leaders to generate momentum behind the stalled global trade talks, at a time when discussions on breaking the current impasse in negotiations have begun again in Geneva. Apec's officials issued a statement on Monday describing progress on concluding the so-called Doha trade round as "never more urgent". "We are realize that the stakes are high," said Australian official David Spencer. "Time is running out." Boosting regional trade will also be high on the agenda with an Apec co-sponsored report arguing that reducing trade barriers and other obstacles to business could generate up to $148bn in extra regional trade.